Our start to my Blue Mountains Day Course couldn’t have been better. 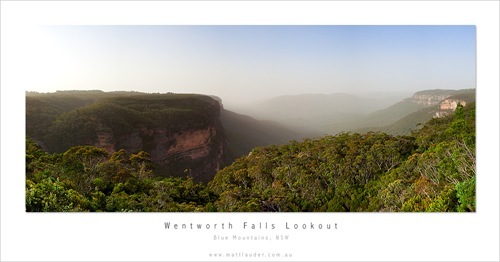 Once again starting from the beautiful Wentworth Falls lookout. This time no crazy sunrise colour like last time, just clean warm light and what turned out to be dust through the valley that blew in over night from central Australia that complemented this shot perfectly. Thanks to Andrew, Peter, Warren and William for a great day of teaching and shooting. New dates for the Blue Mountains Day Course for 2010 have been released. This entry was posted in Uncategorized and tagged blue mountains photography workshop, photo course blue mountains, Photography, Workshop. Bookmark the permalink. How many shots did you use for this? Really great details. Yea the detail in these digital panoramics is amazing. This shot is 10 images @ 32 mm and is about a 180 degree view from the platform. The safety railing is just to the left and right of each edge. I’d like to commend you for taking such a spectacular shot of the Mountains. I find many shots of them don’t look good, because of the haze, but yours do everytime. Well done. Luke the time of day was around 9am and I had a 2 stop lee soft ND filter. cracker photo you have here, when you are doing your digital panos, do u use manual mode?, and also how to you meter for each frame so you get the same exposure?.. Mitch I always shoot Manual and it is a must for panoramics. You have to shoot all your frames with the same shutter speed so you pick the best one that works for the angle / width of your panoramic so you don’t over expose too much in parts. Again it is subject to the kind of pano you are shooting. 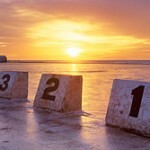 Mid day v’s sunrise or sunset will be quite different in where you light meter read for the panoramic stitch. ah ok thanks for the info matt, do you use a pano head? Killer photo, Matt. May be slightly overexposed in the top right, but apart from that it’s a ripper. nice pic mate, I think crop the blown bit off the left and it would look better to me!